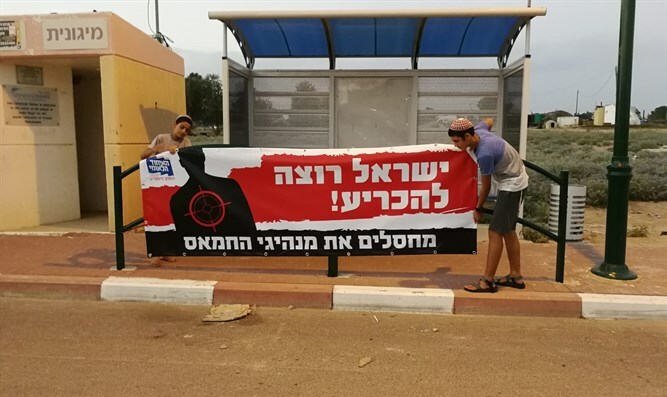 National Union party protests Defense Minister Liberman's response to Hamas terror. Dozens of people from the National Union party's protest headquarters attended protests against Defense Minister Avigdor Liberman's response to terrorism from the Gaza Strip Monday. According to the protesters: "They are not doing enough to eradicate Hamas terror." Agriculture Minister Uri Ariel (Jewish Home) said that the time had come to act decisively. "Let the IDF win. The moment has come for the decision. It is time for the cabinet of the State of Israel to make a decision and bring quiet and physical and mental security to Israeli residents. We must restore security to the residents of the south." "The IDF has all the tools to bring peace to our residents. We demand [that the government] decide immediately to eliminate the Hamas leaders and the sooner the better," added Ariel. National Union Secretary-General Ofir Sofer said that decisive steps are needed in the face of terror. "The time has come for a decision in Gaza that will lead to quiet for more than four years. This is the time to renew the policy of assassinating Hamas leaders. It works in Judea and Samaria and it will work in Gaza, too. We have to stop talking about a unilateral ceasefire, and we must rely on the IDF to do the job properly. "We remember the same Liberman who, at the beginning of the current government, when he sat in the opposition and was able to visit and respond to the conduct of his predecessor in the job, and he strove to replace him. The defense minister is afraid to make a decision on terrorism in the south. Liberman proves once again that 'what you see from there cannot be seen from here,"? Sofer concluded.